So, do you try to locate your fluffy slippers, still half asleep in the morning, to avoid the chill sensation from stepping barefoot on your tiled floor? Or your feet readily sink in the soft shaggy carpet and soak the feeling of comfort and warmth? Let’s be honest! What makes you choose one over another type of flooring for your home is not necessarily related only to the cost of buying it or to the expense, associated with the installation. Other factors like the investment value, design options, health conditions, your family profile and lifestyle or the cleaning and the type of maintenance it would require also play a significant role in making your decision. If you are the main homemaker in your family who is responsible for the household chores, the guide below may offer you an insight into which type of flooring is high maintenance and which requires the least effort and resources to clean. The information endeavors to help you decide on what flooring would suit best your family needs. That’s it if a refurbishment of your floor space at home is in view, of course. Vacuuming alone is not enough to maintain your carpets in pristine condition and prolong their life. They stain easily and take longer to dry, if wetted, than hard floor surfaces. Another drawback with respect to their daily maintenance is that human and pet hairs cling effortlessly to the carpet fibre. Furthermore, there is often the case of common substances becoming hard-to-remove or impossible-to-remove contaminants, once they make contact with the carpet. Professional steam cleaning may remedy some of these issues but it comes at a price. On the whole, carpets become tattered looking within a few years and maintaining them as new for long requires effort, dedication and care. 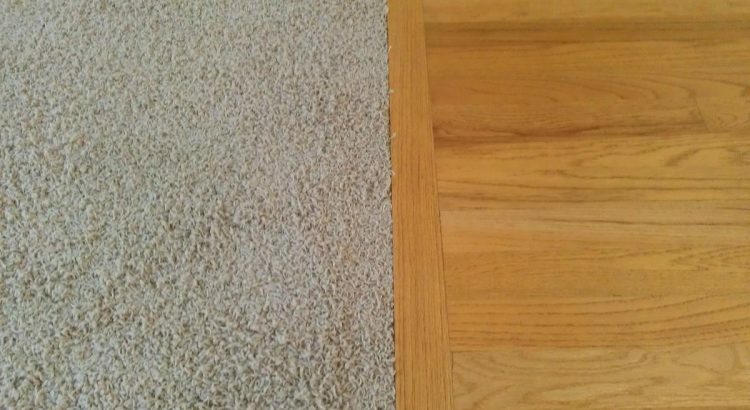 Once a carpet is completely ruined, it usually goes. Unless you have treated it right the whole time. If it has suffered a significant damage to the loop, it is unlikely that you would bother to repair it. Worn out patches in high-traffic areas are also irremediable and are usually concealed with a mat. Moreover, it is not unheard of for most homeowners to run out of stain removal options, especially when pet stains are involved. And when mould comes into the equation, eating away the carpet underlay, restoration becomes even more remotely viable. The same goes for rugs. But looking on the bright side, carpeting is relatively cheap to buy and install. So, what better opportunity than to replace your old carpet with a new one and transform the interior of your home! Hard floorings come in many forms, especially when it comes to the material they are made from. Tiles, hardwood, cork, engineered wood, softwood timber, bamboo, vinyl, laminate just about cover the most popular media, used in the hard-flooring manufacturing industry. Each type comes with its own set of specific properties and cleaning maintenance requirements. Below, we only explore the general characteristics of tiled and wooden floorings in terms of their upkeep and restoration solutions. Tiles can be kept clean with the minimum of effort. If properly protected immediately after installation, a tiled flooring requires only a good vacuuming or sweeping and mopping. Most types of tiles are hardy and stain-resistant. More or less waterproof, they are the preferred material to use in bathrooms and kitchens. Some, however, require an additional treatment in order to repel oil or water stain formations. A sealant or an impregnator is usually applied on unglazed tiles, such as terracotta, quarry tiles and some natural stone floorings. The grout can also darken with time if not sealed. But overall, if cleaned regularly, tiled floors are easy to maintain in good condition. Once a year, tiles will benefit from being professionally cleaned with a steam cleaning machine. Depending on the type of tiles you have and on whether they have been sealed previously, you may need to strip off the old sealant and reseal them again every few years. This would largely depend on the level of usage and cleaning maintenance. Also, if you haven’t opted for a groutless type of tiled flooring, regrouting your floor surface may also be on the cards now and again. To sum it up, tiles very rarely need repairs or replacement and if looked after properly, you can enjoy them for many years. Hardwood floors are an investment that repays. It increases the value of your property if maintained properly on a regular basis. As it is with tiles, wooden floorings require only a thorough vacuuming and cleaning with the right wood cleaner. They may need some attention more frequently than carpeting but this does not make them harder to clean. It is just that there is nowhere for dust to hide and that grit can act as an abrasive if allowed to enter your home. Small particles may scratch the wooden surface and leave undesired marks. Quality wooden floors can last for years if they are cared for and maintained systematically. Prefinished hardwood floorings and those treated and varnished on site are usually sufficiently protected against liquid stains, as long as the accidental spill has been addressed at once. However, over time, different factors may call for some restoration procedures and repairs. Whether we are talking about floorings in high-humidity environments or the general wear and tear your timber floor endures, sanding and revarnishing are the restoration techniques that may be deemed necessary every five to ten years. The good news is that the rehabilitation of your wooden floor will make it look as new. Most people make the smart choice of carpeting only low-traffic floor spaces, such as the bedrooms, where spills and stainings are more unlikely to occur. Whereas communal areas, like the kitchen, the living and the dining room, are furnished with a more durable type of flooring: tiles, timber, vinyl or laminate. This approach usually ensures that homeowners have an easier time with the cleaning and maintenance of their floor surfaces. Professional steam cleaning may remedy some of these issues but it comes at a price. You can also consider getting a home carpet cleaner if you’re looking to prolong the life of your carpet. Andrew Rutherford is a former carpet cleaning technician, currently a service supervisor for Go Cleaners London. He is passionate about home improvement in general and enjoys sharing professional tips.